Serving a guest a Rambutan Martini (AKA Rambutini), at your next dinner party, will make you a star! 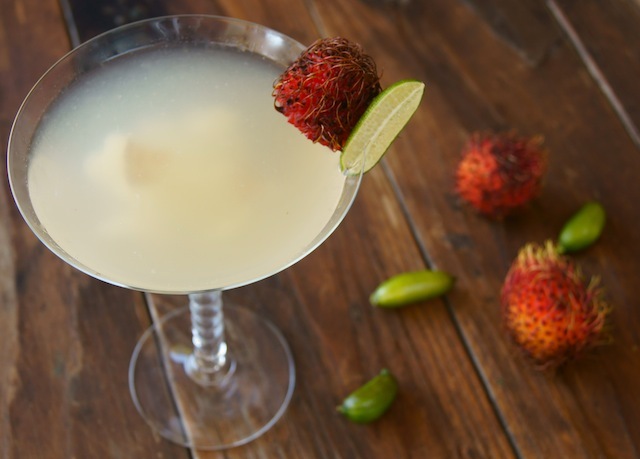 The exotic rambutan fruit lends itself to this refreshing, festive cocktail. This post may contain Amazon affiliate links for your convenience at no additional cost to you. A Rambutan Martini Recipe — I’m calling it a Rambutini. Fun! Have you ever seen one? Tried one? I’d seen these jewels before, but didn’t know their name until last week when I was fortunate enough to learn about this super cool, exotic fruit from Melissa’s Produce. What is a rambutan, you ask? A rambutan is a very beautiful and unique looking fruit that’s closely related to a lychee. What does a rambutan taste like? While its delicious taste is similar to a lychee, it’s slightly firmer in texture and a bit less sweet — though still quite sweet! So, it’s somewhat like an extra sweet grape, without the skin and a with a pit in the center. You should be able to find rambutans in Asian markets — their season seems to vary, depending on where they’re grown, but it’s roughly July through October. I haven’t see too many rambutan recipes, and I’m pleased with my first creation using them. This is a delightful tropical cocktail to serve at your next dinner party! And speaking of dinner parties. . . . I had a small one last night and I’m hoping I can inspire you to recreate it this weekend. Almost every day this week, I’ll be sharing components of the entrée, so you can make it for your guests. And the entrée is. . . . Muscato Grape-Shallot Pork Chops with Mashed Okinawan Sweet Potato and Citrus Steamed Asparagus. Who’s excited? Okay, excellent — but let’s start with a cocktail, shall we? Cheers to Rambutini fruit, and a Rambutan Martini! I hope to make more rambutan recipes in the future, and I’ll share them when I do. Serving a guest a Rambutan Martini (AKA Rambutini), at your next dinner party, will make you a star! This exotic fruit lends itself to this refreshing, festive cocktail. Peel and pit the rambutans. A ripe rambutan should be easy to peel with your fingers. (You might need to make a small cut at the top to get you started.) Be very gentle as you carefully remove the thin skin from the fruit. It will likely come off in just a few pieces. Now use your fingers to dig into the flesh of the rambutan to remove the pit. It should very easily slide right out. Now use your fingers to dig into the lychee a bit to remove the pit. It should very easily slide right out. Add the vodka, lime juice, vanilla, ice, and cooled simple syrup. Cover and shake fairly vigorously for about 30 seconds. Strain into two martini glasses and add a few of the pieces of the rambutan flesh that you strained out as well. You can also make a lychee martini, simply submitting them for the rambutan. You can likely find both fruits canned, and that will work, too. However, it's much more fun to use fresh, if you can find them. If you can't find rambutans at your local Asian market, you can order them here. Did you happen to notice those pretty, unusual limes? Those are Finger Limes. Please use a good vodka -- I like Ketel One or Belvedere. Fun fact: Though rambutan may look prickly, they're not at all -- they're soft! Their name comes from the Malaysian word for hair, "rambut". TRY TITO’S HANDMADE VODKA TOO. IT’S OUTSTANDING! definitely going to try this! thank you. I never tasted Rambutan before, but it sure looks and sounds so interesting! It’s so good, Natalie – you’ll love it! This is so unique to me and looks very interesting. Something new to my addition of refreshments. Need to sip one immediately. Nothing I like more than a drinks after a long day at the office. This is going to be something new and delicious to try. Cant wait!! I hope you love it Krissy. Thanks! As someone who is 37 weeks pregnant I am looking at this and dreaming! Definitely going on my ‘drinks to make once I’ve popped my baby out’ list! I have never tasted rambutans before but I think I saw them in the market in Phuket! This is such a cool drink! Need to see if I can find this fruit here in Italy!